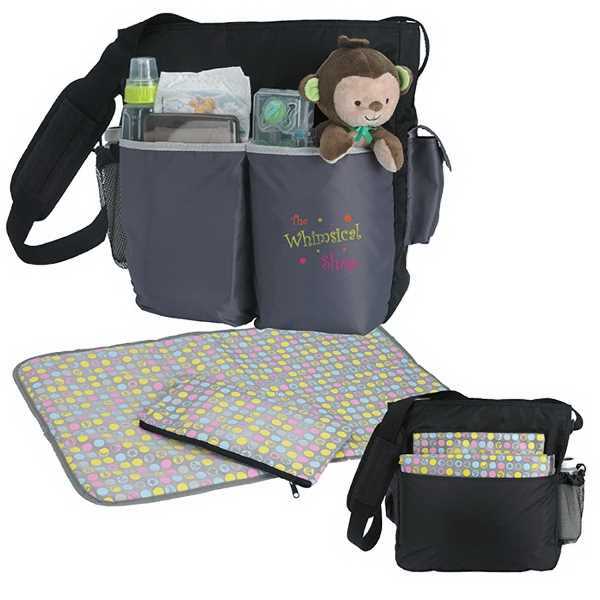 Expect success with a New Tot Diaper Bag; a perfect fit for men and women. The neutral color is ideal for any baby gender. Back pocket is great to insert changing pad for easy diaper change. Mini bag exclusive design, five exterior and interior pockets for easy organization and adjustable shoulder length handle. Measures 12-3/4"w x 13-1/2"h x 5"d. Offer good value, 4 color process and free 24 hour service. Per additional color; 1 additional day.Five exterior pockets (one in the back) and interior pockets for easy organization. Adjustable shoulder length handle. Product Size: 12 3/4" w x 13 1/2" h x 5" d.
Size: 12 3/4 " x 13 1/2 " x 5 "